Just a few days ago there were international reports of Fidel Castro suffering a catastrophic stroke, leaving him incapacitated indefinitely. It seemed certain that not only would he be unable to contribute to the policy making and everyday procedural decisions, but we may not even ever see him make a public appearance again! But in true communist fashion, Cuba released an image of Castro reading the newspaper that declared him to be in horrible medical condition. So who do we believe? Well there are many possibilities that explain these opposing reports, not the least of which is photoshop, but lets be honest, Cuba isn't exactly well-known for their technological prowess. And if there's one thing I learned from my nearly obsessive and encyclopedic knowledge of 1980's slapstick comedy, it's that manipulating a corpse to comedic effect is quite easy! 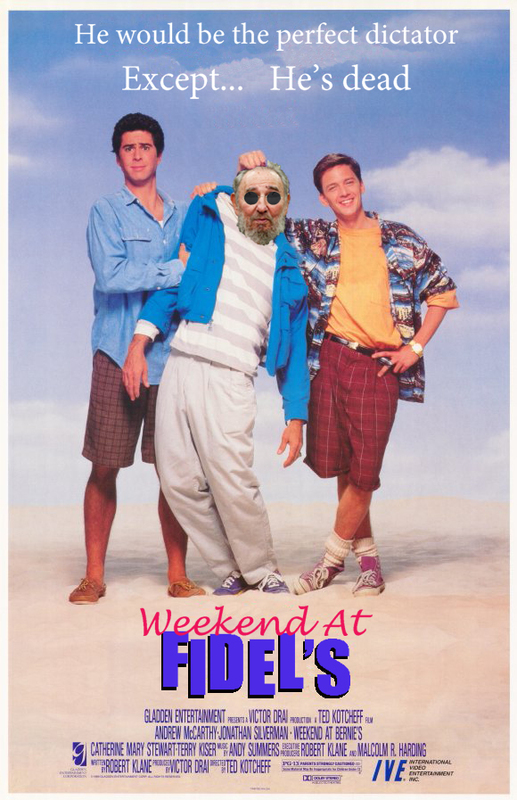 So here you have it, the movie poster for the newest cadaver-marionette film to come charging out of hollywood: Weekend at Fidel's!